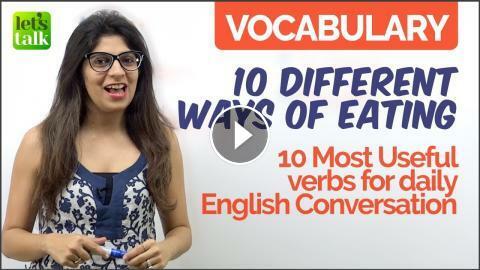 In this English speaking lesson with Niharika, learn 10 English verbs to talk about different ways of eating. This English vocabulary would help you to speak English fluently when you are talking about food and eating habits in particular. Learning English is all about expanding your English vocabulary so that you are never shot of words to speak fluent English confidently. You are watching this English Lesson on Let’s Talk - A library of more than 1300+ free English speaking videos to speak English fluently and confidently. We have English training videos for Learning Grammar, English conversation in the real world, IELTS speaking test, Tips to improve English communication sills, Improving Pronunciation to speak clear English, American and British English lessons and Accent Training that would help you take your English to the next level. Understand your Boss’s English? – Learn Business English vocabulary | Improve English speaking.